I read this article and found it very interesting, thought it might be something for you. 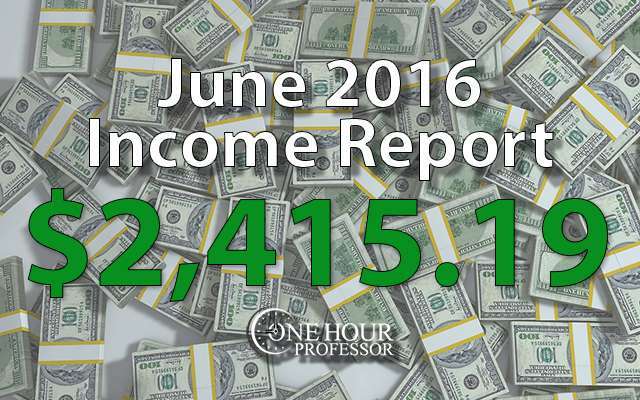 The article is called June 2016 Monthly Income Report and is located at http://www.onehourprofessor.com/june-2016-monthly-income-report/. Another great month in the books and one that I’m certainly proud of. Granted, I didn’t make as much money as I did in the previous two months but I made major strides in my business and I’m confident that the actions I’m taking now will pay off in the future. 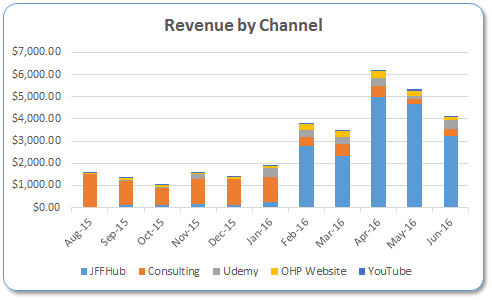 The main project that was completed in June is the launch of my email marketing course on Udemy. By the way, special discount there for you if you’re interested. This particular course is instrumental in the success of my audience because email marketing is a huge part of creating a successful website. I’ll get into the details about how the course is doing within the income report. My income took a little bit of a dip this month and most of that is because my JobsForFelonsHub website didn’t go viral. In the prior two months, in two different instances the website went viral and whenever this happens, it increases the earnings substantially. All in all, it’s really just one page that is going viral. In fact, at this point in time, this page on the website has had over 162,000 shares on Facebook alone. As cool as that is, it didn’t happen in June but hopefully it will happen a few more times in the coming months. I’m not promoting the website in any way, it’s 100% organic. The thing worth mentioning this month in terms of expenses is how much has been invested in my new authority website. This month alone I spent just over $1500 to get content created and I assure you that I’ll continue to spend here until the website is where I want it to be. You may be wondering why I am spending so much time and money on this website and it comes down to one thing. Long story short, the authority website that I’m creating has a huge market and if it is successful, it could easily make $10,000/month. I’m not sure if I’ll be able to reach that, but if I can then obviously a be a pretty happy guy. For now though, I’m just going to continue to have my writers create content and give my developers what they need to accomplish the overall functionality that I want the website to have. Aside from the new authority website, the other thing that is contributing to my expenses here is the writing for the housing for felons database. In July I think we’ll be able to finish up the housing for felons database so that there will no longer be high expenses. Once this is done, I think I’ll just focus on link building and publishing blog posts. JFFHub Update: I think this month we are seeing more normalized numbers with the website. The income that’s coming in is from multiple sources including Google AdSense, Indeed.com, and various partnerships. I’m thinking that this will continue to increase as my rankings get better within Google. The thing that I’m really focused on now (and have been working on for the last month) is link building for the site. This is the practice of getting other people to link to the website to increase its authority in the eyes of search engines. I’m doing this because if I am able to get more links to the website, it will increase my rankings, thereby increasing my earnings. However, I’m realizing that getting links is very difficult and time consuming. That’s okay though, this is a long-term play and I’m learning as I do it. I’m hopeful that it will pay off eventually. In July I plan on reaching out to the media to see if I can get the website featured on news website. In addition to that, I’ll also continue to do link outreach myself outside of news agencies to see what I can do. My eventual goal is to outsource the entire link building process once I’ve got it down to a science and it works, but as of right now I’m still figuring it out and it just takes time to get that right. In addition to link building, I also have a writer completing a housing for felons database. This is something that is really needed in this niche and I think could end up increasing my views significantly if I’m able to get a few links to it once completed. Consulting Update: I had a few meetings with potential clients in June, but I don’t think that I landed any. Truth be told I’m not really focusing that hard on consulting any longer because my passive income channels are maturing. I still have one solid consulting client that I work with regularly, but I am not sure if that will continue in the future because they hired a new marketing person. With that being said, I’m not necessarily opposed to consulting, but it has to be a project that I enjoy and for a price that I’m willing to work which is never lower than $100/hour now. Udemy Update: A big part of June was focused on completing the email marketing course I’ve been working on and launching it. There was a lot of work put into this and after reviewing the overall numbers, I was shocked to see that I spent $950 to get the course completed. The high cost was mainly on my video editors and there was a smaller part of that in transcribing the lectures. Obviously that’s a lot of money and at this point I’m not going to work on another course until that one is paid off through earnings. Based on the income this month, it looks like that’s going to take about 2 ½ months which is totally fine with me because I need to take a break from making courses. The good news though is that in June I made just over $300 back from the course and that means that as of right now the amount of investment in this course is about $650. I’ve determined my next course will be on Outsourcing. There are a lot of people that need to understand how to outsource correctly and I’ve probably spent over $15,000 in outsourcing over the last few years. Plus, I’m an advocate of creating a website while being employed and outsourcing is a BIG part of leveraging your money to buy more time. I think a lot of people will like the outsourcing course and I’ll make sure to keep everyone updated on its progress here. OHP Website Update: I really didn’t do too much on One Hour Professor in June because my focus was on finishing the Udemy course. However, I have really big plans for the OHP website in July. Long story short, I’ve never been able to sell a lot of courses on the One Hour Professor website and I want to figure out how to make that happen. For starters, in July I’ll be transitioning from Aweber to ConvertKit for my email functionality. This will allow me to segment my email lists and do advanced “if then” statements that Aweber just isn’t capable of doing. This will be crucial to selling more courses on the website because it will give me the ability to construct a full funnel that I can introduce people to. The other thing that I’ll be doing is integrating Thrive Ultimatum into the funnel to create scarcity around my courses. If you haven’t seen Thrive Ultimatum yet, it’s truly AWESOME and gives people more reason to purchase. You can learn more about it by clicking here. I think this will help me a TON, but we will see after I send people to the funnel what happens. Based on a lot of the stuff that I’ve been reading, I can expect to fail the first time that I create this funnel. The idea is to drive Facebook traffic to a piece of great content and then pitch them on the mini course. From the mini course, they will be pitched the full course. But if I make little tweaks in the weak points along the way and keep altering the funnel, I’m told this will eventually succeed. We’ll see how this goes, but my plan is to eventually get people to purchase a course and then upsell them into other courses or even sell them bundles of courses at a reduced rate. TJHQ Update: One of the interesting things that I noticed in June was that my other website that I rarely talk about, www.TranscriptionJobsHQ.com, has over 1000 visitors every single month. This was a bit of a shock to me because I haven’t touched the website in at least six months and it consistently generates $20-$30 a month in Google AdSense income. I don’t break it out in my income reports because it’s so miniscule and isn’t worth the work. Out of curiosity, in June I put an email opt in pop up on the website to see how many sign-ups I got and was shocked to see I was getting at least one a day. I think this is a huge opportunity for me and in July I’d like to rethink the way that I’m using this website to increase the amount of revenue that it generates. Based on the traffic and the email list opt ins that I’ve seen already, I’m sure that I can make this website so that it generates a few hundred dollars a month and no time. From there I may grow the website further by hiring a writer, or I may just sell the website and make a few thousand dollars. New Authority Website Update: I am spending the majority of my money creating informational databases on this website full of great information. I’m not comfortable with disclosing the URL yet because there’s just so much more work to do and I don’t want someone to swoop in and try to copy me. The money that I’m spending is in development costs and mostly on writers. If you ask me, the one thing that you should never be afraid to invest in is writers because they give you assets (the writing) that will always be on your website and save you hours of time in the process. YouTube Channel Update: I really don’t do too much on my YouTube channel and it’s amazing to me that I’m almost making $100 with it. I have no plans to focus on my YouTube channel in the future, but every once in a while, I will get an idea for a tutorial and I’ll throw it up there to help people out. I think if I really focused on YouTube, I might be able to increase the revenue significantly, but it’s just not something that I want to do. I did launch the new authority website and everything went over successfully. As of right now, I’m looking at around 250 visitors every month which is low, but I have confidence that this will increase after my writing is done and I’ve gotten a few links. I was able to launch my email marketing course this month and had some success with it. I’m hopeful that this course will sell even more in July and by the end of August, my initial investment will be paid back. As long as I can continue to make back the money that I invest in my courses, I’m totally fine with continually creating new ones. Guest posts were NOT completed this month. The reason is because I haven’t yet gotten to this level of link building for the website. In my opinion, I should first focus on creating relationships and trying to get links on resource pages of the websites. After I’ve done everything I could possibly do to get those links, at that point I’ll reach out to do guest posts on career-oriented websites. When I actually get to the point of guest posting, I’ll likely outsource the writing and just generate links from the places that I am guest posting to. I really need to focus on getting the One Hour Professor website to make more income. I know this is possible because I have the courses to do it, but I just have to figure out the right funnel to make it happen. So this month, I’m going to move to a more powerful email system called ConvertKit that will allow me to do the segmentation that I need. The funnel that I was using previously on One Hour Professor involved people getting access to the mini course and then pitching them to purchase the full course. This is great, but I don’t think a lot of people really invested time into that mini course and it led to a lot of opt ins, but very little action. I’m going to re-examine my funnel in July and find something that I think will be more effective. As of now, I’ve designated Thursday as the day that I focus on link building for my websites. Right now the focus website is JobsForFelonsHub and I want to get 10 back links for the website by the end of this month. This is definitely no easy task and will take a lot of work, but if I continue to get back links to the website then eventually I’ll be able to rank on my core search terms which will increase my revenue by at least double. I *really* like your income reports, especially the fact that you track how many hows you’re spending on it. 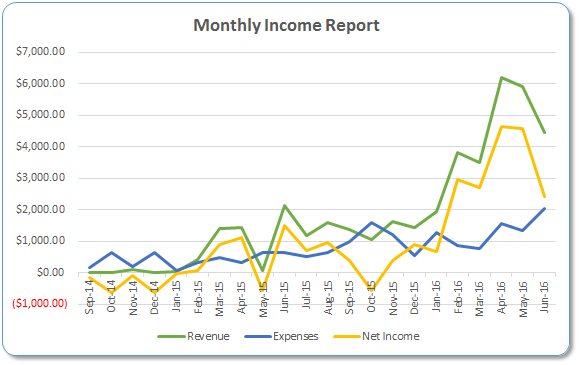 I’ve just started my journey into making some extra money online and intend to share as much detail as I can in my income reports. I think from next month I’ll try and track the hours I spend. I’m really grateful you shared the numbers from the very beginning too. Should hopefully keep me motivated.